Fixated as this nation is on whole-grain anything, the most logical variation on no-knead bread is to make a whole wheat version. 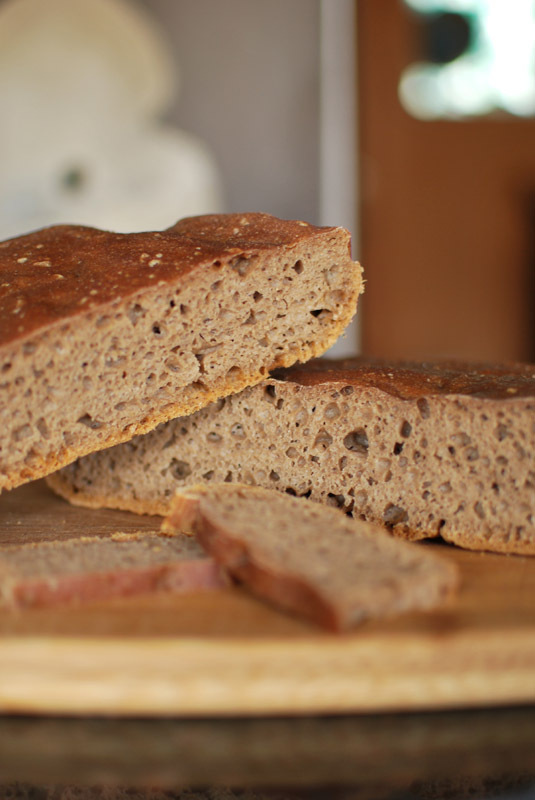 Normally, I would never try to adapt a white bread recipe to whole wheat by simply swapping all the white flour for whole wheat flour; this almost always results in a dense, flat bread, more suited to propping a door open than to eating. The technical reasons are important here. Whole wheat flour retains the bran of the wheat kernel, which essentially means that there are sharp little flakes in your dough. As you knead, these sharp bits of bran act like tiny knives, cutting the gluten as it forms, under the pressure of your hand or dough hook. 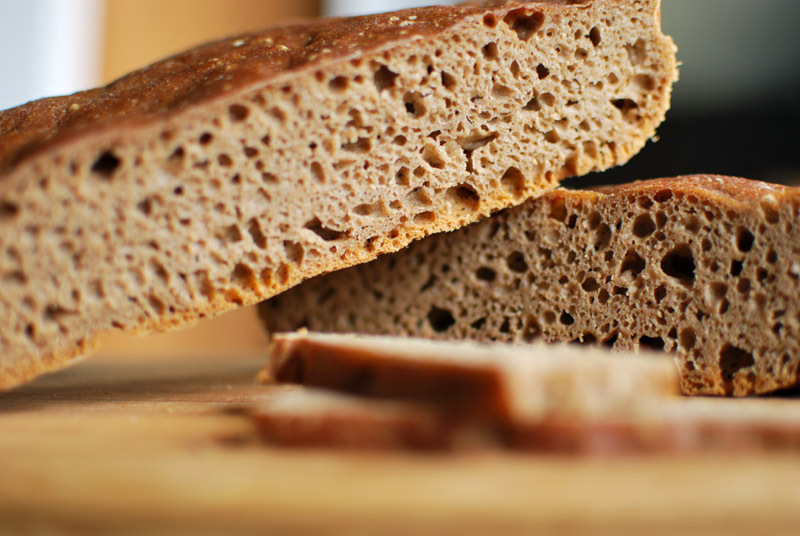 Since it is the network of gluten that traps air in dough (giving you those lovely holes in the loaf), the lack of gluten means there is less air, meaning your bread comes out dense. But! In no-knead bread, the gluten isn’t formed by kneading, but by time and natural dough fermentation processes. Ergo, if using whole wheat flour in a bread that requires no kneading, the gluten should gently form around the bran, as there is no pressure to force the bran through the gluten strands. And when you do finally shape the loaf, the bran should have softened enough by absorbing water that it wouldn’t have the same knifely ability. So, armed with this hypothesis, I swapped all the white flour for whole wheat. Everything else stayed the same: yeast, salt, water, rising time, baking temperature, everything. Result? Good and not-so-good. The good part was that I was right about the gluten and bran; there were indeed some very lovely holes in the crumb, bigger than you’d certainly expect from a 100% whole wheat bread. But the not-so-good part was the flavor. The lack thereof, actually. The woeful lack thereof. Familiar with the taste of wet cardboard? You will be, after eating this bread. The color turned an odd purpley shade (I don’t remember adding blueberries…), and the oven-spring was, shall we say, inadequate. True, this flat, grayish bread did have a pleasant texture: barely coarse at all (though I do love a rustic, grainy bread), quite moist, with an appropriately sturdy crust. But unless you’ve got ageusia and also happen to be blind, I don’t think you’ll appreciate this one much. It’s not surprising that it reminded me of those ill-fated loaves of Grant Bread from a few weeks back; the methods are quite similar, though that recipe used more yeast. Apparently, whole grain breads need something more than time and patience, which alone will improve nearly any white bread recipe. This challenge certainly requires more study and perhaps a new approach; surely it can’t be that difficult to make a good no-knead whole grain bread. 1. In a large bowl, whisk together the flour, yeast, and salt. Add the water, and stir until blended; the dough will be shaggy and sticky. Cover tightly with plastic wrap, and let dough sit at room temperature for at least 12 and up to 24 hours (but preferably about 18). 2. The dough is ready when its surface is dotted with bubbles. Line a 10 inch skillet or any wide, shallow bowl with a large square of parchment paper. Turn the dough out onto a well-floured work surface; sprinkle it with a little more flour and fold it over on itself a few times, until it forms a roughly round shape. A bench scraper helps greatly with this step. 3. Transfer the dough to the parchment-lined skillet, and dust heavily with wheat bran or additional flour. Cover loosely with plastic wrap and let rise until doubled in size, about 2 hours. When it is ready, the dough will not readily spring back when poked gently with a fingertip. 4. At least 30 minutes before baking, preheat the oven to 450º F. Put a 6- to 8-quart heavy covered pot (see note 1 below) in oven as it heats. When the dough is ready, carefully remove the pot from the oven. Transfer the dough to the pot by lifting the parchment by the edges, and carefully and quickly lowering the dough into the pot. Shake the pan once or twice if dough is unevenly distributed, but don’t worry about it too much; it will straighten out as it bakes. 5. Cover the pot with the lid, and bake at 450º F for 30 minutes. Remove the lid and bake uncovered for an additional 15 to 30 minutes, or until the loaf is well-browned. An instant-read thermometer should register around 205º to 210º F when fully baked. Transfer to a wire rack to cool thoroughly, discarding the parchment. 1. Any heavy covered pot will do, be it cast iron, enamel, Pyrex, stainless steel, or ceramic. As long as it’s oven-safe, it seems anything will do the trick. If your chosen vessel has no lid, or if you’re concerned about the oven-safety of it, simply use aluminum foil instead, pressing it tightly (and carefully) around the preheated pot. America’s Test Kitchen has a recipe up for Almost No-Knead Whole Wheat Bread–Season 9, episode Breadmaking, Simplified. I haven’t tried the WW version, but the regular version works out quite nicely. Maybe you can get an idea about what to try next by checking it out. You will need to register with them by giving them an email address to access the recipe. First, I’ve been reading your blog for a while and really enjoyed it. Secondly, a few of things I’ve learned from making 100% whole wheat beer bread. 1&2b) both of the above help with the structure of the bread… you typically only need to do one or the other from my experience…don’t know if it’s needed with the long rise times since you stated that structure and texture seems good… however, one benefit of the pastry ground whole wheat flour is that it does seem to expose more of the inner starch / sugar to development of a flavor profile (that’re really the difference between white and wheat flours in the flavor department, a higher percentage of the white flour is available sugar). 4) I suspect some brown or raw sugar might help the flavor profile a lot as well. Anyhow, thank’s for the great blog. I’ll be playing with this recipe sometime soon. Kris: Keep an eye out in the next couple of days! That’s one of the variations I’ll be talking about this week. Ha! No, I wasn’t reading ahead, just sharing stuff I’ve figured out whilst trying to get some recipes (esp beer bread) to work well with whole wheat flour. Yeah, that new recipe screams to be tried with WW Pastry Flour and Beer instead of water. PS – After reading that new recipe, I know understand (or maybe remember) why there was vinegar in the ATK recipe (couldn’t, for the life of me, understand why to use beer AND vinegar). I’m delighted to have found your site. I was also most interested to read about your efforts to create a whole wheat bread using Lahey’s method. My new book, Kneadlessly Simple, includes several really nice whole wheat breads, including a 100 Percent Whole Wheat-Honey bread. Getting a good recipe required lots and lots of testing–arg! However, due to an interesting approach, sometimes called making a mash, I was able to devise a fine tasting bread (she says modestly!). The mash changes the taste and texture of whole wheat flour completely. Incidentally, though my KS recipes rely on long, slow rises like the Lahey bread, they are somewhat different (and easier). They are all made using ice cold water, which for complex chemical reasons improves flavour and some are baked conventionally rather than in a Dutch oven. Several sample recipes are posted on my site, though not the 100 Percent Whole-Wheat Honey Bread. Hope you will check them out. Hey just to add another option — the Pain a la Ancienne from Breadbakers Apprentice can be more or less no-knead depending on your laziness. More importantly, making it with 1/2 or even 2/3 ww flour improves the taste dramatically..
Tim: You’re absolutely right; that’s a fabulous recipe, and is shockingly easy to make. Thanks for the comment! Nancy: Thanks for your lovely comment! Your site has some great recipes on it; the Crusty, Seeded Pale Ale Boule certainly caught my eye. I love the way beer makes a no-knead bread really sing. I’m definitely going to check out your Kneadlessly Simple, and congratulations on your most recent and quite interesting publication! Happy baking from one bread lover to another!